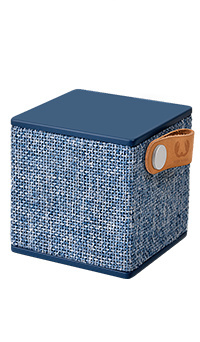 The Fresh 'n Rebel Rockbox Cube Fabriq Edition is a Bluetooth speaker that combines excellent sound quality with a contemporary look – perfect for music and design lovers. Use your left and right arrow keys to choose a colour. Use the tab key to exit the colour chooser. This stylish speaker uses Bluetooth to connect to your devices, and lets you enjoy up to eight hours of non-stop music on a single charge thanks to the long-lasting battery. The Rockbox Cube uses Bluetooth to connect seamlessly to compatible devices such as your phone, tablet or laptop. This powerful wireless speaker lets you enjoy your favourite tracks with the freedom to move from room to room. Covered in a special-woven fabric with multi-coloured threads, the Rockbox Cube is not just a real pleasure for your ears, but your eyes as well. With a choice of three must-have colours, you can easily match the speaker to your personal style. With its 8-hour battery life, the Rockbox Cube allows you to enjoy your favourite tracks anywhere, anytime. Bring your tunes to parties, the beach, and the park – and listen to eight hours of non-stop music on a single charge.